NORMAN, Oklahoma, April 27, 2011 (ENS) – A storm system extending from the Great Lakes southward to the Texas Gulf Coast combined with moisture from the Gulf of Mexico is bringing another day of rain and severe thunderstorms to much of the region. The most severe thunderstorms are expected in the Tennessee and Ohio river valleys, according to the National Weather Service Storm Prediction Center. The Tennessee Valley is forecast to receive up to six inches of rain over the next 24 hours. Ahead of the cold front, winds will gust between 35 and 45 mph. The most intense storms are expected across northern Alabama, far northwestern Georgia, northeastern Mississippi and southern Tennessee, according to the National Weather Service. State and local emergency managers are monitoring this “potentially very dangerous situation,” the weather service said. Severe thunderstorms are forecast over the Great Lakes, Ohio Valley and the Mississippi Valley, producing destructive winds, hail and tornadoes. Several inches of rain will add to the ongoing flooding in Kentucky, Indiana and Ohio. The Ohio and Mississippi Rivers are forecast to have major flooding with the possibility of historic flooding along the rivers from Kentucky-Tennessee border on the Mississippi through the confluence at Cairo, Illinois and up the Ohio River into Kentucky. Pounded by heavy rains all week, the rising Ohio River is expected to set a flood-crest record Thursday at Cairo where it meets the Mississippi River. For the first time since 1937, the U.S. Army Corps of Engineers is considering blowing a hole in the Bird’s Point levee and letting flood waters from the swollen Mississippi River spread across the farmlands of Mississippi County, Missouri, in the southeastern corner of the state. 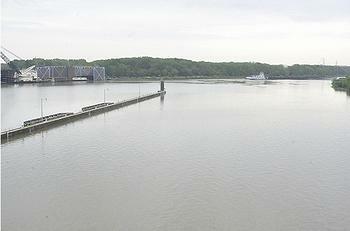 Bird’s Point is just downstream from the confluence of the two great rivers – the Ohio and the Mississippi. Blasting the levee open there would fill the New Madrid Floodway, an area designated in 1928. The decision is up to Major General Michael Walsh, president of the Mississippi River Commission, who is in Mississippi County today. Meanwhile, county authorities today ordered a mandatory evacuation of the floodway land. To the west, the Black River had topped a levee in 30 different places by noon Tuesday. Roughly 1,000 homes were evacuated in the town of Poplar Bluff, and Governor Jay Nixon called out the Missouri National Guard to assist with extreme flooding there. No fatalities have been reported. Authorities evacuated Poplar Bluff residents to the Black River Coliseum, where over 250 people are sheltering. On Friday, tornadoes blasted through more than a dozen cities in St. Louis and St. Charles counties, Missouri, destroying several hundred homes. To the east of Missouri, flooding along the Ohio River forced a dozen families to flee their homes in Metropolis, Illinois today. On Monday, Illinois Governor Pat Quinn issued a disaster proclamation and called out the National Guard to support local governments affected by the severe storms that have persisted over the past two weeks. Forecasts for more heavy rain this week could send swollen waterways even higher and cause widespread flooding throughout the region. To the south, in Arkansas, 11 people have died and 14 others have been injured in the tornadoes and flooding throughout the state. There have been 45 tornado warnings in the last 24 hours. 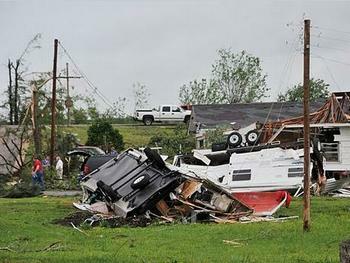 tornadoes have damaged homes, businesses and caused power outages affecting some 88,000 people. The local emergency coordinator in Washington County, Arkansas reported that there were 17 water rescues in the City of Springdale, 36 in the City of Fayetteville, and 27 throughout the county on Tuesday. 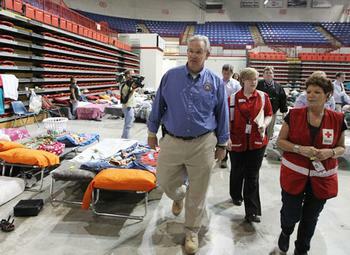 Arkansas Governor Mike Beebe has declared a state of emergency and is touring the stricken areas. President Barack Obama called Governor Beebe Tuesday afternoon, and the Arkansas governor told him to expect a request for a Presidential Disaster Declaration in the coming days. To the east in Kentucky, Governor Steve Beshear has declared a state of emergency due to the severe storms and flooding across the state beginning last week and has activated the Kentucky National Guard. No fatalities were reported in Kentucky, but authorities have reported power outages, damaged homes and businesses in several counties. Damage assessments are ongoing. In Tennessee, Governor Bill Haslam declared a state of emergency Tuesday as a precautionary move because of the severe weather and forecast of Mississippi River flooding. “Activating the Tennessee Emergency Management Plan allows the state to swiftly react to any requests from local governments,” said Haslam. “It appears the threat of heavy rain and flooding is not over. Residents should continue to be on heightened alert, be prepared, and stay informed,” said FEMA Region VII Administrator Beth Freeman. FEMA has pre-staged emergency commodities across the United States and has staff on standby should they be needed to support state and local emergency response operations.